Arts Assembly hosted an iteration of Jacob Gleeson’s Tent Shop from August 8-10th, 2017. As an intervention in Harmony Arts Festival, Jacob Gleeson created an interior installation space in the tents usually intended for art and craft sales. Elaborating on and abstracting the idea of the market and its history, Gleeson transformed the space into a bizarre and speculative departure from the tradition of the arts festival. collectively construct a creative commons. This gathering space was used to discuss how cultural spaces are imagined. This project used recycled wooden shipping pallets and other found materials. We encouraged participants to consider fantastical futures for the area where anything is possible, stepping away from typical responses to 'culture.' We then discussed how we can put these ideas into action. We believe collaborative, artistic and socially-innovative answers are increasingly needed to address many of our cities’ issues, whether it is searching for creative approaches to community engagement or developing new designs for underutilized spaces. Crazy Dames is an artist studio founded in February 2016 by co-directors Jennie Suddick, a visual artist/educator, and Sara Udow, planner at GPA. As an ode to Jane Jacobs, the seminal urban theorist often dismissed as a ‘crazy dame’, we use arts based methodologies to explore Jacobs’ ‘crazy’ ideas and collaborative approaches. Crazy Dames believes that collaborative, artistic and playful interventions are needed to address many of our cities’ issues, whether it is searching for creative approaches to community engagement or developing new designs for underutilized spaces. As such, they develop inclusive, small-scale and tactical artistic happenings and creative forums aimed at generating conversations and new ideas about how we design, interact and play in our cities. This project was supported through the District of West Vancouver. Artists Hannah Jickling & Helen Reed hosted a taste-making focus-group with kids in Horseshoe Bay at the Gleneagles Community Centre. Up the hill from ferry queues, coast mountain vistas, kites for sale, (and with the threat of BMW car alarms in the distance), children were invited to create both delicious and disgusting flavor combinations. Participants learned how to make cotton candy, and collaboratively created their own flavours. Werthers Originals mixed with Sour Apple Jolly Ranchers and Vicks cold lozenges resulted in Fruity Butter Vapo-floss! These unique cotton candy confections were then sold to a hungry public, who were getting out of yoga classes or attending the Youth Week movie night. Helen Reed and Hannah Jickling have been collaborating since 2006. Their projects take shape as public installations, social situations and events that circulate as photographs, videos, printed matter, and artists’ multiples. They are currently fascinated with the “contact high” intrinsic to collaborative work, especially in their recent projects with children. Giant vegetable growers, orienteers, and therian teens also feature in their work. Helen and Hannah have exhibited and performed internationally, with both individual and collaborative work appearing in such venues as: The Portland Art Museum (OR), The Dunlop Art Gallery (SK), Smack Mellon (NY), The Yukon Arts Centre Gallery (YT), YYZ Artists’ Outlet (ON), Carleton University Art Gallery (ON), Dalhousie University Art Gallery (NS), The Vancouver Art Gallery (BC), The Power Plant (ON) and Flat Time House’s first issue of NOIT (UK). In Spring 2017 they will release Multiple Elementary, a book explores the elementary school classroom as a site of invention and reception of contemporary art practices, co-published by YYZBOOKS and Black Dog Publishing. They currently teach at the Emily Carr University of Art + Design in Vancouver, Canada where they received the 2016 Ian Wallace Award for Teaching Excellence. On Saturday, March 25, 2016, this workshop led by Justine A. Chambers and Alana Gerecke was an effort to shift attention to the back sides of our bodies. To engage our back-bodies, we will begin by taking a backwards walk through the ARTS ASSEMBLY's surrounding neighbourhood. From here, the workshop continued indoors with a physical exploration of how the back of the body invisibly supports frontal movement. Together, through movement and discussion, we worked through the questions: What does it mean to invest attention in the space behind us, both kinetically and metaphorically? How can we learn to sense the ways in which we accumulate and carry all that we leave behind? Using our shared research, we will collaboratively compose a dance generated by the intricate movements of support found from the backs of our bodies. Justine A. Chambers’ interests lie in collaborative creation and re-imagining dance performance. Drawn to the movement of all bodies, and focusing on the dances that are already there – the social choreographies present in the everyday – she has been creating performance projects throughout Canada since 2000. Chambers is a founding member of projet bk and associate artist to The Dance Centre. Her recent works include: Back Up Front, The Choreography Walk, Family Dinner, Family Dinner: The Lexicon, Back It Up, Enters and Exits and COPY. Her choreographic projects have been presented at the Canada Dance Festival, The Western Front, Dancing on the Edge Festival, Dance in Vancouver, Dance Saskatchewan, New Dance Horizons and The Music Gallery. Recent collaborations include projects with Evann Siebens, Claudia Fancello, Su-Feh Lee, Marilou Lemmens & Richard Ibghy, Jen Weih, Brendan Fernandes and Josh Hite. Chambers works actively as a performer and leads classes in contemporary dance technique throughout Canada. Justine A. Chambers is Max Tyler-Hite’s mother. Alana Gerecke : I am a dancer and dance scholar perpetually concerned with the relationships of bodies to space. I create and study site-based work, and I fixate endlessly on how the backstories of movers, movements, and their surroundings intersect, overlap, and diverge. I hold a PhD with a focus on dance and performance studies, and I am currently researching the social choreography of flash mobs in my Postdoctoral work at York University. I have danced professionally for over a decade with companies including EDAM, Battery Opera, Projet In Situ, and others. I continue to train in somatic techniques. I have taught dance, improvisation, performance theory, and performance history at EDAM and Simon Fraser University, and I’ve guest-taught at York University and the University of British Columbia. I also bear regular and emphatic witness to my toddler’s expanding physical experiments with the material world. Aura, Carriance, & "dead things"
On no fixed schedule, we will be hosting lectures followed by a dance party dj'd by the speaker. The subjects of collectivity, revolt, euphoria, music, pleasure, bliss, music, dance, and bodies will be engaged first with the mind, and then with movement. Our first lecture/DJ set was lead by Benjamin Kamino on Wednesday, March 8th,2017, in Boom Box’s semi truck trailer, presenting a conversation rooted in his current MA research in choreography at DAS Graduate School (Amsterdam). Kamino unpacked some current interests through the modalities of lecture/presentation, conversation, and physical practice. And then of course... a dance party. The photograph is important to think about -- a captured effort of a dancer supporting a new political party: I.N.O. ; whose campaign took the form of a durational contemporary performance for an audience -- so many efforts, all with a different direction and purpose and yet in concert. Ruairí Donovan himself describes his effort of carrying a dead thing -- a former ideology, a hope for a future, a forgotten struggle and a matrix for ideas and histories we do not realise we are carrying. Boom Box is an alternative 53 feet of performance space, developed in a semi-truck trailer. Its parked location is off of Great Northern Way, just west of VCC Clark Station. ARTS ASSEMBLY presented its first collaboratively curated publication, exhibition, and short film festival with Treignac Projet, an artistic research residency and gallery in the Limousin region of France. This project was centred around the idea of the archipelago; a geographical term that categorizes a group of discrete islands as part of a networked system, as well as the ways in which this structure is reflected in collaborative artistic practice, interpersonal politics, and ways of being in the world. The publication and exhibition featured work from Bronwyn McMillin, Sam Basu & Liz Murray, Rosen, and Kelwin Palmer and launched at Dynamo Arts Association on Friday, February 3, 2017. We hosted a screening of a series short films on Wednesday, February 8, 2017. View Archipelago here or buy a copy in our shop! On Saturday, February 11,2017, Soledad Muñoz Fiegehen and Tifanie Lamiel led Handmade Electronic Music: The Art of Hardware Hacking. In a time where the mass production of goods has homogenized our audio/visual landscape, and where hardware and software can dictate the outcome of an artistic exploration, it’s necessary to deconstruct our relationship with electronics to its most simplified form. Based on the book by Nicolas Collins “Handmade Electronic Music: The Art of Hardware Hacking” this two part workshop explored the principles of electronic art through applied learning. The first half covered analog principles: from electromagnetic fields and coil antennas, vibrations and pick-ups to synthesis through the building of an oscillator. The second half was an introduction to coding with Arduino micro controllers and LEDs. Soledad Muñoz Fiegehen is an interdisciplinary artist born in Toronto, Canada and raised in Rancagua, Chile. Currently based in Vancouver, her work seeks to explore the analogy between the ever-changing social spaces we inhabit, the inter-connectivity materialized in the woven structure and an embodied experience of sound. In 2014 she founded Genero, an audio project which focuses in the distribution and greater representation for women working in the sound realm. Soledad was the recipient of The City of Vancouver Mayor’s Arts Award for Emerging Artist in Craft and Design and The Emily Carr President’s Media Award – Installation/Interactive Media. Tifanie Lamiel is an interdisciplinary artist from Vancouver BC. As a practitioner of mindfulness mediation, her work is a response to everyday chaos through the use of technology and disruptive algorithms. On December 10, 2016 DDOOGG introduced their bookmaking practice before leading participants through all the steps required to make ones own serigraph using limited resources. This included a demonstration of how to build and stretch a screen, followed by the hands-on production of creating a stencil, preparing and developing a screen, and printing your design. Participants printed on both paper and a limited edition Arts Assembly tote bag, which they are invited took home from the workshop. DDOOGG is a small comics press and print collective formed during their final year at Emily Carr University of Art + Design. Cristian Hernandez, Juli Major and Tylor MacMillan are active participants in an emerging Vancouver artists community, often collaborating in other collective ventures such as Late Cuts, Puddle Popper and KIOSK, where they host readings and performances with groups such as CPI, Cowboy City Rockers and LIT LIT LIT LIT. DDOOGG have participated in The Vancouver Art Book Fair, Toronto Comic Arts Festival, Canzine West and LA Art Book Fair. In addition, DDOOGG created and maintains ddoogg.ca, a new curatorial web platform engaging with virtual space in an effort to celebrate diverse aesthetic sensibilities"
On November 19, 2016 Caroline Ballhorn and Jenny lee Craig led an afternoon of textile dying, fort building and discussion about the nature of the creative process. 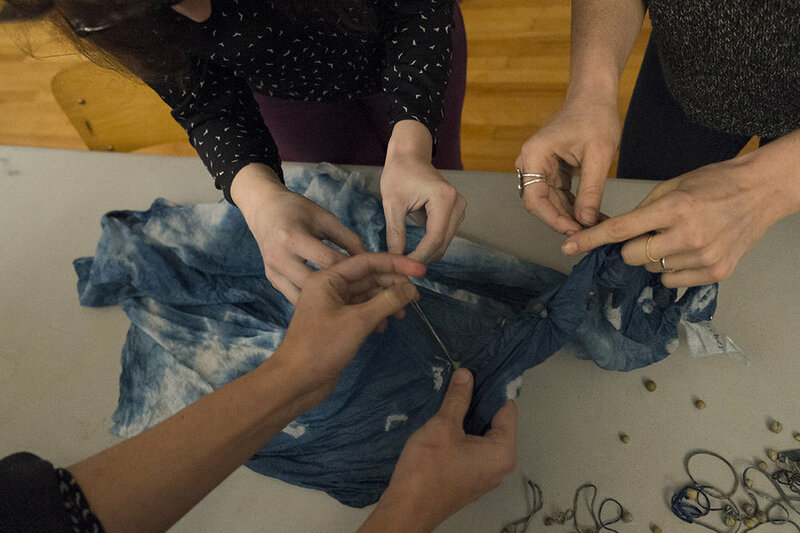 Participants practiced the art of Shibori with natural indigo dye. All participants went home with a piece of indigo shibori that they have made themselves on 100% cotton and information on how to continue to practice indigo shibori at home. Tin Can Studio is a mobile project space housed in a vintage 18ft Streamline trailer. Their fully mobile portable studio has been designed to transform to accommodate a variety of creative activities, and acts as a incubator, a hub, and an event space. They love to transform and pop-up in unexpected locations, where they can engage with a diversity of communities. They work with institutions to develop unique programs centered on community building, host their own incredible events and workshops, and create unforgettable experiences for weddings and other celebrations. Tin Can Studio consists of Jenny Lee Craig and Caroline Ballhorn. Caroline Ballhorn is a Vancouver-based artist, designer, and creative facilitator with a background in sculpture, print-making, drawing, textile-based and social/community-based/participatory creative work. She is an avid paper enthusiast, with a strong opinion about pastry crusts and pies of all sorts. When she’s away from Tin Can Studio you can find her singing with a local indie rock choir, or touring the world as a back-up singer. She received her BFA from Emily Carr University of Art + Design in 2010. October 15, 2016 dance artist Emmalena Fredriksson led a two hour workshop combining practices of experiential anatomy, social dreaming and disco dancing. Exploring both our individual and collective impulses to dance, the session will begin with a movement warm up allowing participants to tune in, stretch and focus on their own body’s needs and desires. Following this, we connected with one another through a dream sharing exercise that will lead into a playful group dance improvisation with abstract disco. Through the combination of these three approaches Fredriksson created a space to contemplate and discuss the experience of dance as felt in our physical bodies, collective mind and through social interaction. This workshop was open to all ages, experience, and abilities. Born in Sweden, Emmalena Fredriksson received her training at Balettakademien in Umeå and at SEAD (Salzburg Experimental Academy of Dance) in Austria. She holds an MFA degree from Simon Fraser University and has presented choreographic work, performed and taught internationally with Daghdha Dance Company (IE), Pact Zollverein (DE) and Falmouth University (UK) among others. Based in Vancouver, Canada since 2013 her work has been presented in Dance in Vancouver’s Choreography Walk curated by Justine A. Chambers, The DanceCentre’s Discover Dance Series and at the Audain Gallery. Emmalena regularly teaches at Modus Operandi, Harbour Dance Centre and Training Society of Vancouver. Continuing her research into choreography as a relational practice in the expanded fields of dance, upcoming work includes collaborations with the visual art platform HAUNT, composer Alex Mah (EDAM) and a virtual reality dance film project. ARTS ASSEMBLY began our programming on September 24th, 2016, with Vancouver artist, Holly Schmidt who led an exploration of the still life and vanitas characteristic of Dutch painting in the 16th & 17th century through the creation of floral arrangements. The workshop will begin with a look at how these painters captured the passing of earthly life through imagery of abundant bouquets on the verge of decay. Following this, participants were invited to forage for foliage in the surrounding neighbourhood, and, with a range of local blossoms, arrange their own still lifes and vanitas, photographed by the artist. Participants took their arrangements home at the end of the workshop. Holly Schmidt is a Vancouver artist with a research-based practice that engages processes of collaborative research and informal pedagogy. Moving across disciplinary boundaries, she explores the relationships between practices of making, knowledge creation and the formation of temporary communities. Her recent exhibitions and residency projects include Till with the Santa Fe Art Institute Food Justice Residency (2014/15), Mess Hall as part of the residency Society is a Workshop at the Banff Centre (2013), Moveable Feast at the Burnaby Art Gallery (2012) Grow with Other Sights for Artists’ Projects (2011) Moveable City with Cineworks (2009) TEI: Tangible, Embedded Computing Conference with M.I.T (2010) She is the Assistant Curator, Learning at the Contemporary Art Gallery and a sessional instructor at Emily Carr University of Art and Design.